UPDATED: Crown Prince Haakon, Defense Minister Grete Faremo and top military officials were among those attending the arrival in Oslo Thursday of the flight carrying Lt Col Siri Skare. The career military officer was killed in last week’s attack on a UN office in Afghanistan. “It is with deep sorrow that we return Siri to her nearest family,” Inspector General Finn Kristian Hannestad of the Norwegian Air Force said during his formal remarks at a somber ceremony at the military portion of Oslo’s main airport at Gardermoen. Skare, age 52, was Norway’s first female military pilot and often flew the type of Hercules aircraft that landed at Gardermoen at noon on Thursday, carrying her casket. It was flown on Thursday by the same squadron in which she had served. As Norwegian military officials had confirmed earlier in the week, Skare received full military honors. She was the 10th Norwegian, and first Norwegian woman, to be killed while serving in Afghanistan. Skare had started serving in Afghanistan for the second time last August and was supposed to be there for one year but not as part of the active military. Rather, she was working for the UN and was unarmed, charged with helping secure a sustainable community structure in the country, economic growth and security. Her long career ended last Friday, when she was among those killed by demonstrators who attacked the UN office in Mazar-i-Sharif in the northern part of the country. 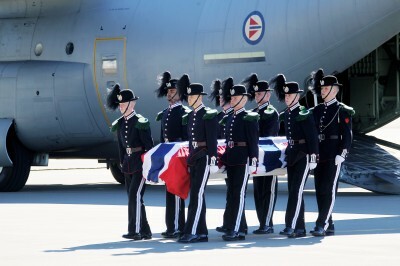 Following Thursday’s ceremony in the hangar at Gardermoen, her casket was to be officially released to her family. Skare will be buried on April 14 at Grytten Church outside her hometown of Åndalsnes, in the county of Møre og Romsdal, according to local newspaper Åndalsnes Avis. All flags in the area will fly at half staff on the day of her funeral, according to Mayor Torbjørn Rødstøl. Faremo, Foreign Minister Jonas Gahr Støre and Prime Minister Jens Stoltenberg have all condemned the attack on the UN and hailed Skare’s work in Afghanistan. She and the other UN workers were unarmed when attacked, and involved primarily in humanitarian efforts to rebuild the country. Norway has had troops in Afghanistan since 2003 and most of its military operations are centered in the northern part of Afghanistan.